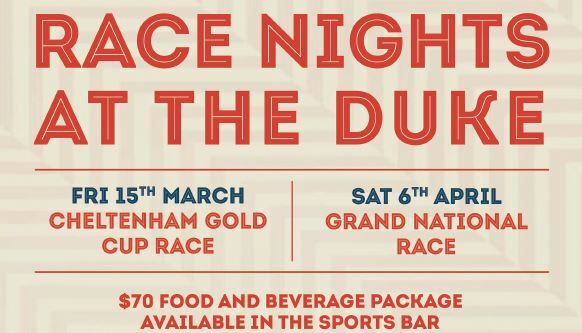 Saddle up for Race Nights at The Duke with TWO huge UK race nights showing live and loud at your local! We'll be running Race Nights for both Cheltenham Gold Cup on March 15th AND The Grand National Cup on April 6th! Get Tickets to the race of your choice below, with our three hour free flowing drinks package including roving canapes for just $70pp + bf available for both race nights! Please check the dates on the sessions below to make sure you're purchasing the correct night, tickets are only valid on the night selected and if you would like to attend both race nights, you will need to select BOTH sessions. *Please remember our sports bar is strictly 18+ and no minors will be permitted entry at any time. Please Remember: Tickets for this event are strictly non-refundable. If you have purchased a Double Pass for the event it must be used by the same named ticket holder for both nights and can not be shared or exchanged with another customer.